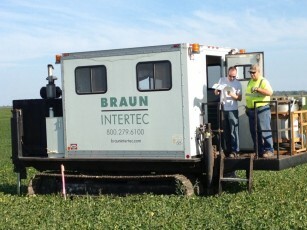 Braun Intertec owns and operates a substantial fleet of trucks and specialized equipment. This means the right equipment is available and operating at peak efficiency whenever and wherever there’s a job to be done. Our drilling fleet includes more than 20 drill rigs that include truck mounted, flotation tired, tracked and skid rigs. In addition, we have CPT rigs and a direct push GeoProbe®. With our rigs, sampling soils, rock coring, in-situ testing and instrumentation installations are all possible. Specialty services include: cone penetration testing (CPT) and seismic CPT, dilatometer testing, vane shear testing, geophysical surveys, push-probe sampling, angle drilling, barge-mounted drilling and down hole camera capabilities. When your project calls for drilling inside a building, in tight places, or to evaluate environmental contamination, the GeoProbe is well-suited for the job. The rig is compact enough to navigate confined spaces and terrains that larger rigs cannot. Because the push probe collects continuous samples in the field, our engineers and scientists are able to characterize subsurface conditions quickly. The information collected by the GeoProbe can be used to evaluate the soils on your project site, help determine the flow of groundwater, identify contaminated areas and determine structural requirements for construction. CPT provides fast, reliable real-time results. Cone Penetration Testing (CPT) rigs are one of the most popular and widely accepted in-situ soil tests for evaluating a site’s soil strength and support capabilities. 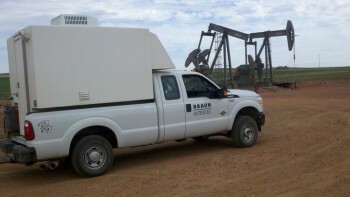 Having both truck- and track-mounted rigs allow easy access to any site. CPT technology evaluates subsurface geologic conditions continuously and in real time. The information collected helps optimize designs and reduce risks associated with building on your site. With this technology, we can gather real-time measurements that can be interpreted to make decisions on site, which saves time and offers flexibility in the project scope. 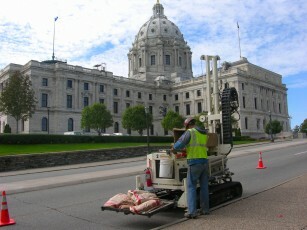 Ideal for tight areas or inside buildings, the skid-mounted auger drill rig performs probes and auger borings. 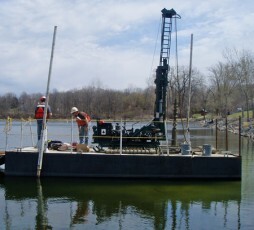 Its smaller size makes it ideal for mounting on a barge for water projects. These rigs offer stability when your site is unstable due to soft soils. They are useful when soils/sites are too soft or when snow is too deep for truck or flotation-tired drill rigs. Additionally, we have rigs with flotation tires for minimum site disruption if your project is located in a wooded area, on uneven ground or is landscaped. Our nondestructive examination (NDE) field radiography units are equipped with the latest technology to provide efficient film processing capabilities and computer-generated reports in the field. Our fleet of radiography darkrooms and radiography equipment are updated and provide our technicians the best equipment to perform field inspections in an efficient and timely manner.